Take a moment to think about the last time you had a delicious pizza. Remember how the cheese was gooey and warm? The toppings smelled delicious right before you opened your mouth to take a bite. Now, imagine that pizza attacking your face just as you were about the make it your lunch. 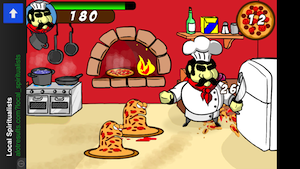 Pizza War is a battle between you and your food. Only this time, your food has a good chance of winning. I’m not sure if alien pizzas have attacked a local restaurant or if the building’s proximity to a nuclear power plant had unfavorable side effects on the food. Regardless, these pizzas are out for blood. Sure, all you did was squish the dough under your rolling pin, smear scalding sauce all over it, and then humiliate it by dressing it up with toppings. That’s no excuse for this delicious food staple to come back for vengeance. Yet, there you are. 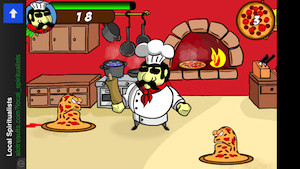 All you have is a rolling pin to fight off man-eating pizza. 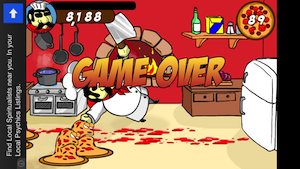 To show that pizza who’s boss, just tap on the offending entree. If you need to reposition yourself in the kitchen for a better advantage, hold your finger on the area you want to move to. 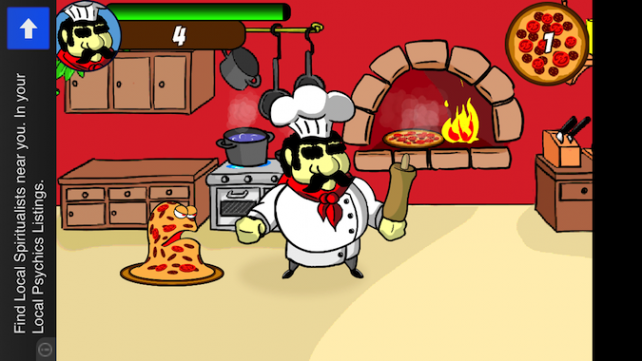 As you kill more and more pizzas, you eventually unlock new weapons that can be found around the kitchen. To pick them up, hold your finger on them. 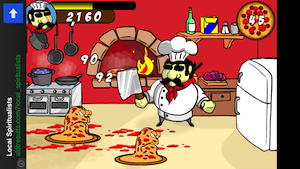 Each weapon kills the pizzas faster than the last one. Sadly, you’ll eventually succumb to these possessed pizza pies. You have a health meter in the upper left corner. When your meter runs out, you’re done for. 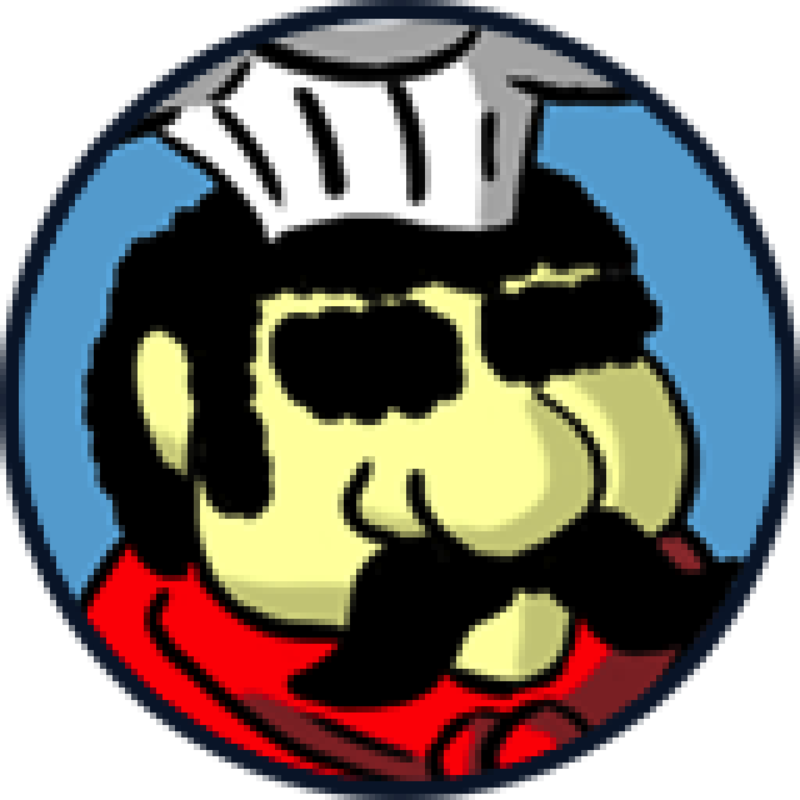 If you’re curious about how many pizzas you took down before they got to you, there’s a counter in the upper right corner. This game is one of those simple apps that get you hooked. You keep thinking that you can beat your best score. 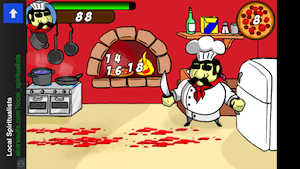 The silly enemies oozing along the floor, and the poor chef who’s trying to fight them off make this game even better. 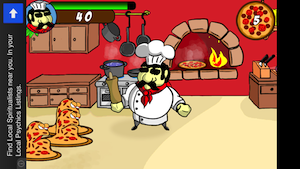 Pizza War is a universal app, and it’s available in the App Store for FREE!